Just when I thought I was done pulling huge flagstones out of the ground, I put my shovel down to plant a new grouping of coneflowers yesterday and heard that familiar 'chink.' I am immediately disgusted that my quick planting is now going to take an hour while I dig this thing out. And it did take forever, it was huge and also partly under the neighbor's fence. Finally, without any more 'America's Funniest Videos' moments, I had it loosened enough to wiggle and pull it out with my hands. And, poor flagstone was freed from it's earthy prison. 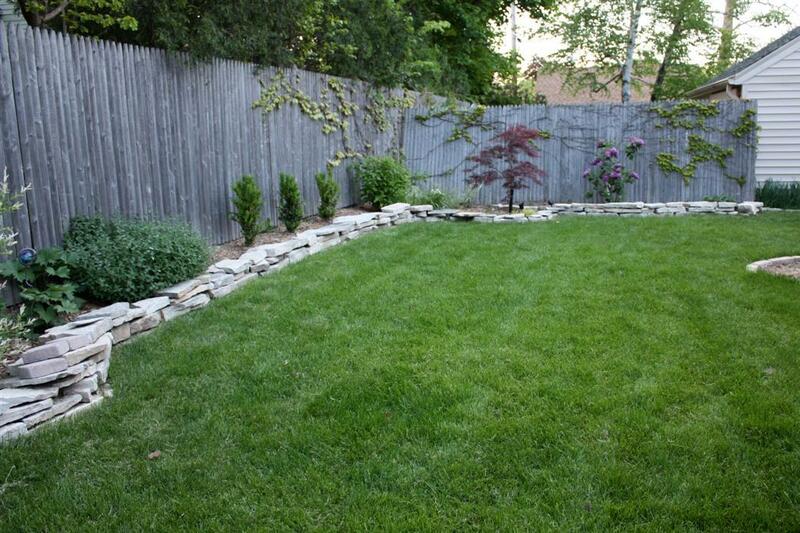 Thanks, Boozie Susie for burying 100's of flagstones in our yard and planting grass over them! Who knows how many more we will find....but all of the stones in our mini retaining wall were once underground, so I'm quite sure there are still more in there. Oh happy day. Oh but that's seriously a cool stone. Can you come over to my yard now and dig up the ones we have? lol. It really is annoying though, except with the previous owners of our home, instead of burying large stones they buried loads and loads of small stones and gravel, in the most random of places and those places seem to be all the spots where I want to clean up, go figure lol. Your grass is so flippin pretty. Nice work on the stone - you totally won! We have a similar (though less pretty and more hidden) retaining wall of ancient patio stones and brick that we found buried about six inches under our lawn. My husband had them all dug up and ripped up and, when they just sat there for a month, I asked why he didn't just bury them and plant grass over them without ripping them up. It wasn't like they were in the way of anything... He agreed that it would definitely have been the preferable way to go. Now, if they were where I wanted my garden, it would be a totally different story. On the positive side, I love the retaining wall! so if it makes you feel any better, we had to dig up a ton of cinderblocks! they were buried in a line all along our driveway. and we have more in the backyard- some are part of the retaining wall... so gross. we think the original owner a long long time ago must have owned a masonry business! that is one thing i am not sad to be leaving- cinderblocks! love that your buried hardscape was reusable and cool! Still, on the bright side, it meant you didn't have to buy flagstones, right? Right? Bueller? OMG! We have the same problem in our yard! Only it's broken up pieces of concert that we keep finding buried all over our yard. I don't get it! I'd say been there done that except you didn't mention flying obscenities from mouth. That's how I roll when I get frustrated at 'yard stuff'. Our previous owners seemed to have buried asbestos shingles in our backyard. I find them about everytime I plant something new. oh duh! PS - your yard looks amazing!! Admit it. Your life would be far less adventurous if it weren't for Boozy Susie. You love her. PS your yard makes me jealous. All that lush grass and awesome vines growing on the fence. I think maybe Boozie Susie used to live at my house! I've dug up over 2000 pounds of buried concrete in my yard so far. Of course, the other day I dug up animal bones, so in retrospect the concrete wasn't so bad. To the people with concrete...it's probably construction debris from when your neighborhood was built...doesn't make it any less fun though. I have the same problem in my yard! It sure makes it a lot more work to fix up the landscaping--those things can be heavy! No no no. Squirrels don't 'giggle'. They are way too nefarious for 'giggling.' They 'snicker' or 'snigger'. Only. I think Susie should now be crack whack Susie......boozie just isn't enough anymore. Digging up huge stones/bricks is a regular event in our yard too. Listen for the mournful call of "Fraaaaank!" and you'll know we just found another one. Your yard is still years ahead of ours though! Love it! That's crazy! Your lawn does look great though.